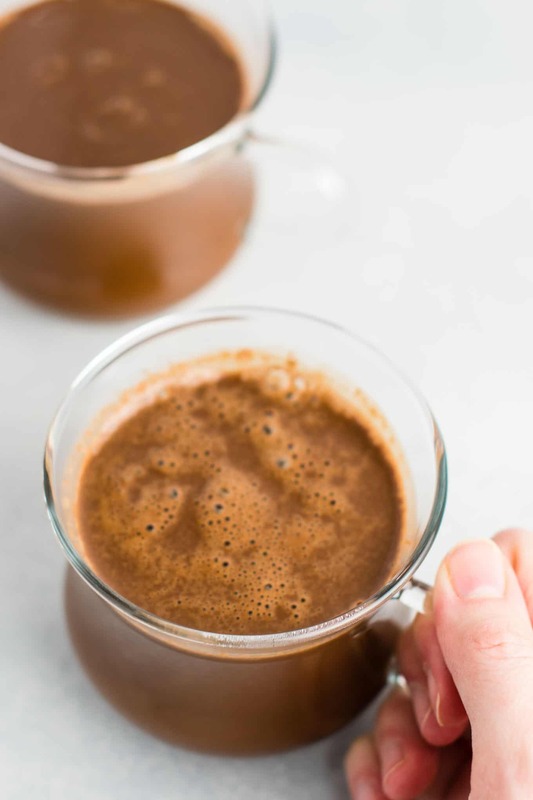 Hot chocolate is one of my favorite drinks to indulge in this time of year. I remember when I was in high school going to chilly football games and drinking hot chocolate on cold fall nights. The concession stands also served hot coffee, but I found that nothing cut through the bone chilling cold quite like a steaming cup of hot chocolate! Something about hot chocolate just warms you right down to your bones. 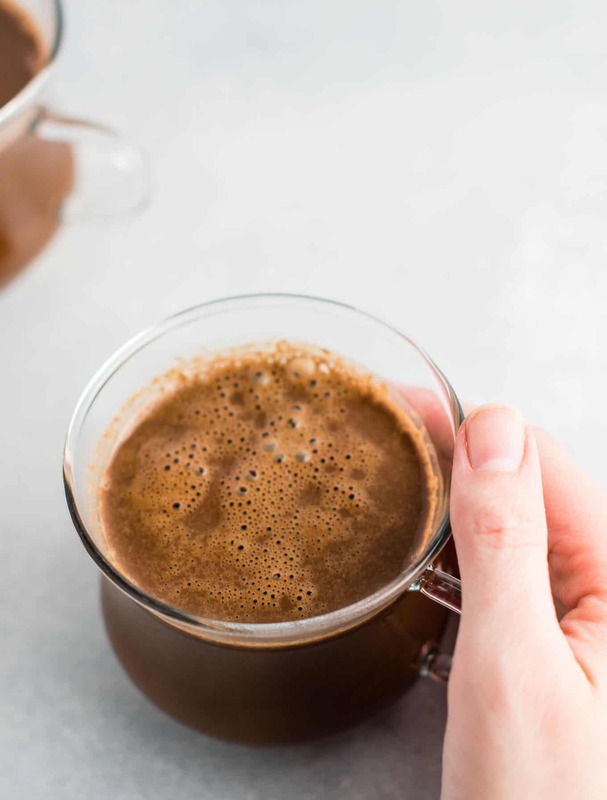 Many people might assume that all hot chocolate contains dairy, but I created a delicious way to enjoy hot chocolate that is totally dairy free! I’m pretty confident when I say that you will be totally satisfied with this delicious hot treat! It’s also incredibly easy to make, and requires just four simple ingredients. 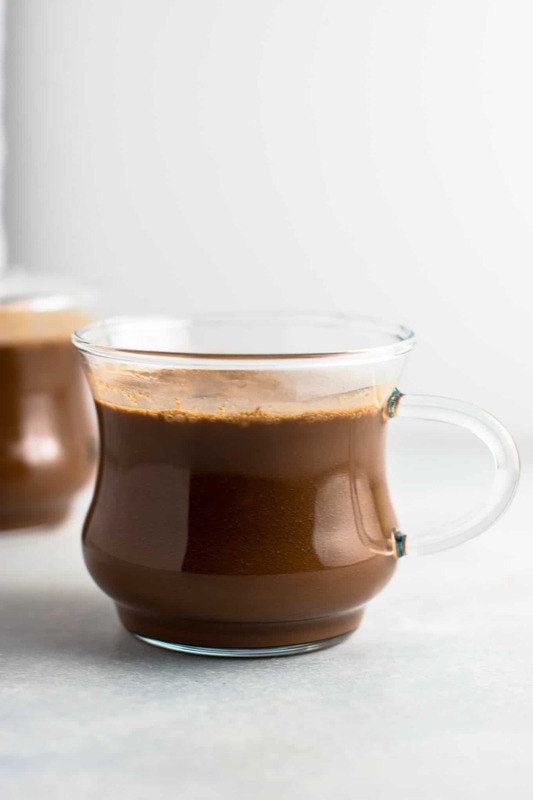 To make your hot chocolate, simply combine all ingredients in a medium sized sauce pan. Turn heat to medium low and stir/whisk until totally combined and melted. This will take less than 5 minutes and it’s done! This recipe will serve two cups of chocolate. My husband LOVES all things Christmas, and that includes hot chocolate. The man has been begging for hot chocolate for months now. I made this for him last weekend and he was practically in heaven! Something about hot chocolate is just so nostalgic and cozy and makes me dream of happy family gatherings and wintry nights spent in. This recipe serves two, but is easily doubled (or tripled) to serve a crowd. You could even make a big batch on the stovetop and transfer to a slow cooker to keep warm until serving. I know this will be in my slow cooker for any Christmas gatherings. Perfect for easy, delicious sipping. 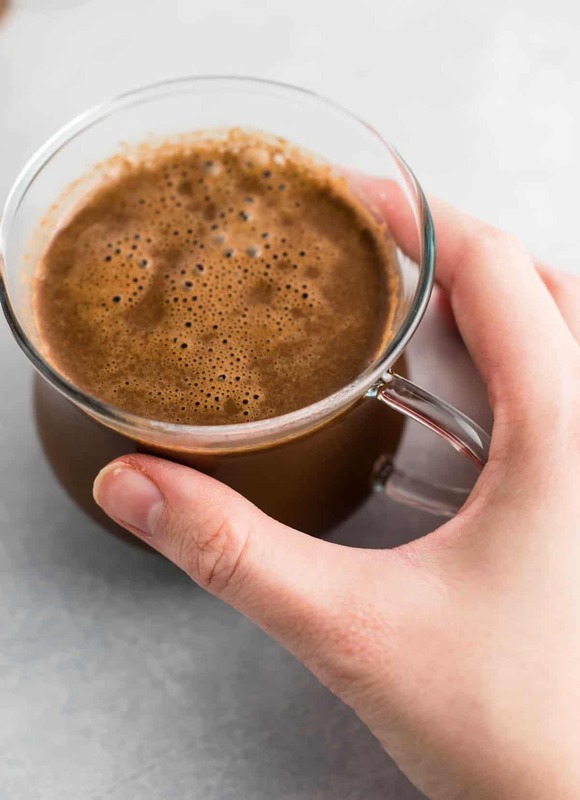 This vegan hot chocolate is ready in less than 5 minutes and really couldn’t be any simpler. I decided to make my own hot chocolate after not being able to find any at the store that weren’t full of junk. I remember the first time I looked at the ingredients in a typical hot chocolate and was shocked. I knew I could make it much healthier, and simpler at home. It is naturally vegan and dairy free, but if you are not, feel free to sub in any milk that you have on hand and it will work just fine. As far as dairy free chocolate chips – I like Enjoy Life brand, and use them in all of my vegan chocolate recipes. What’s your favorite hot chocolate memory? Hungry for more delicious dairy free Christmas recipes? Here are some of our classic Christmas favorites! 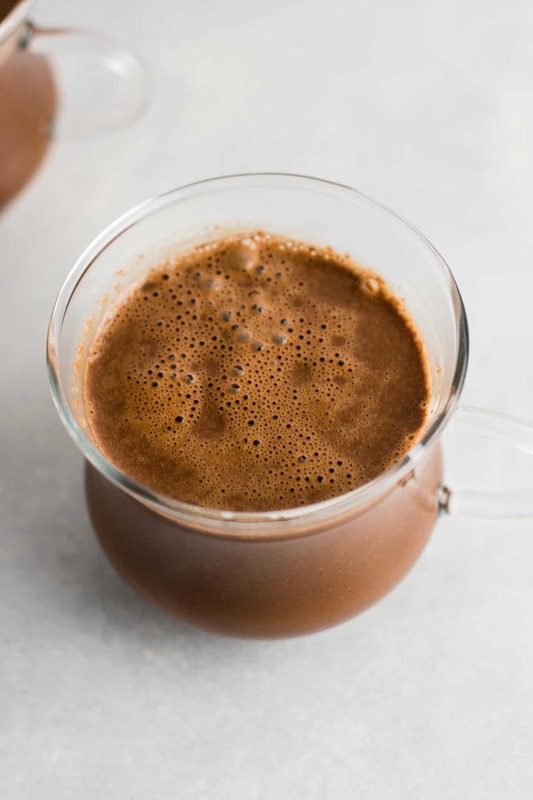 Easy and delicious vegan hot chocolate made with just 4 ingredients!